Nice three-name assassin names as well. Sorry to tell you, “clicking” didn’t open any pages. 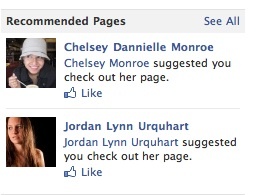 oh, I didn’t put a click-through link, but you can search them on Facebook. I have to remember to start putting click-throughs. “Feces-Book.” I closed my account two days ago. Hilarious! I hope that was the point….